Puri, Gaya, Kashi (Varanashi), Sitamadhi, Ayodhya, Naimisaranya, Chitrakoot, Prayag Tirtha (Tri-Sangam) etc. 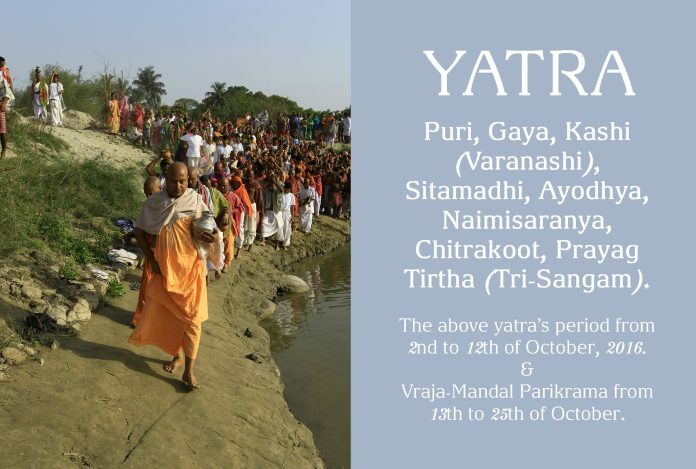 The above yatra’s period from 2nd to 12th of October, 2016. Tentatively cost of the above yatra Rs. 7000. Vraja-Mandal Parikrama from 13th to 25th of October. Tentative cost of Vraja-Mandal Rs 8,000. Puri: 1. Srila Bhakti Siddhanta Saraswati Goswami Thakur Prabhupada’s birth place, Sri Chaitanya Gaudiya Math. 2. Jagannath Deva temple. 3. Gambhira (small room, where Lord Sri Krishna Chaitanya Mahaprabhu manifested pastimes last 18-years while He was physically present in Puri). 4. Siddha-Bakul (Haridas Thakur Bhajan-Kutir). 5. Haridas Thakur’s Samadhi Mandir, 6. Chakratirtha. 7. Tota-Gopinath temple (garden of Gopinath, where Gadhadhar Pandit used to stay with the vow of Kshetra-Sanyas). 8. Shevata Ganga. 9. House of Sarva-Bhowma Bhattacharya (here Sri Krishna Chaitanya Mahaprabhu show His six arms to Vasudeva Sarva Bhowma. 9. Jagannath Ballava Udyan (Roy Ramananda’s place), 10. Narendra Saravar. Idradyumna Saravar. 11. Nrisimhadeva’s temple & Gundicha temple. Lingaraj temple & Ananta Basudeva’s temple; these temple are situated at Bhubaneswar, it is 60 K.M far from Puri; therefore we have to go by bus. Gaya: 1. Vishnupada Temple, 2. Akshaya-Vat etc. Kashi: 1. Adikeshava Temple, 2. Vindu-Madhava Temple, 3. Pancha-Nadi Ghat, Vishwanath Temple. 4. Annapurna-Temple. 5. Vishalakshmi Temple etc. Sitamadhi: 1. Place of Balmiki Ashram. 2. Birth place of Lav & Kush & Ramayan. 3. Disappearance place of Sita Devi. Ayodhya: 1. Ram-Janmabhumi (Birth place of Lord Ramchandra), 2. Kanaka Bhavan, 3. Dasharath Bhavan, Sarayu Snan (bathing in Sarayu river). Naimisharanya: 1. Chakratirtha, 2. Gomati Snan, 3. Svayambhuva Manu and Satarupad Devi’s Tapasvya Place. 4. 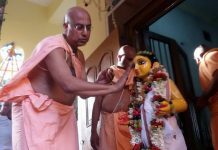 Suta Goswami recited Srimad Bhagwata place, 5. Lalita Devi’s temple. Chitrakoot : 1. Ramghat, 2. Janakighat. Alahabad (Prayag): 1. Triveni (Trisangam) snan (bething), 2. Dashashamedha Ghat, 3. Akshay Vat, 4. Bharadwaj Muni’s Ashram. a). Each devotee should bring one steel plate, cup, bed-sheet, mosquito-net etc. b). We are expecting the tentative expenses of the above mentioned places by train & buses of rupees 7,000 (equivalent of 100 USD) from Puri to Mathura and rupees 8000 for Vraja-Mandal. The said amount includes travel from Puri to Mathura and entire Vraja-Mandal. Devotees have to manage their travel reaching to Puri and return to their respective places from from Vrindavan by their own endeavor. c). During travel for Ayodhya, Naimisharanya etc. sometimes travel will be during night also. d). 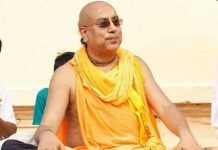 Accommodation During Yatra will be provided in halls; if any devotee is expecting separate room facility, in this case devotee should pay extra money for the room facility. e). Here, Yatra has two part, Puri to Alahabad & Vraja-Mandal; if any devotee is interested to do one part then the devotee will pay off the cost accordingly. 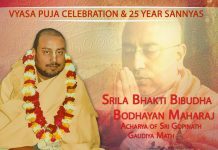 Will this parikrama happen under the guidance of pujyapad Bodhayan maharaj?